Mon., Feb. 26, 2018, 8:34 a.m.
A GRIP ON SPORTS • It’s playoffs time in (much of) college basketball. In fact, one local school, Whitworth, is set to find out where it is headed in the NCAA tournament. It probably won’t be all that far. Read on. • What is the most important Western state in college hoop? The next few weeks that honor will be held by Nevada. The Silver State, once home of the cheap buffet, will host every major conference’s postseason tournament between now and Selection Sunday. The WCC is in Las Vegas. The Big Sky in Reno. The Pac-12 also in Las Vegas. The only Division I western conference that doesn’t hold its postseason get-together in Nevada is the Big West, which is sort of ironic. After all, UNLV used to win the conference just about every year before jumping to the Mountain West, whose conference tournament is in Las Vegas. The bright lights may beckon for the Division I schools, but the Division III postseason is different. And that difference may be starkly illustrated today. Which means the NCAA tournament isn’t the same either, and we’re not just talking about the lack of Charles Barkley and Kenny Smith. Schools host the first rounds. And every decision is made with the bottom-line involved. 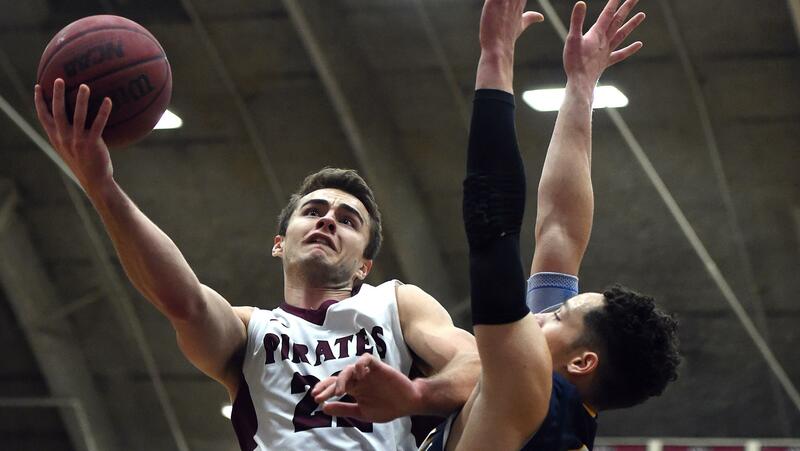 Which means Whitworth may have to repeat its performance of Saturday night, when it handed top-ranked Whitman its first loss of the season and did it on the Blues’ home court, if it wants to move along. The NCAA sets up four-team pods, with geography playing a big part. The organization’s version of the West includes schools in Minnesota and Nebraska and Illinois. Which means the Pirates will probably be in a pod that will include Whitman, a school from one of the Midwest states and the SCIAC champion, Claremont-Mudd-Scripps. Where the pod games be played? As there is a good chance the Blues will still be the top-seeded team, there is a good chance they will host. Which brings us back to the paragraph above: Whitworth may have to repeat its performance of Saturday night. Walla Walla may not be Vegas or Reno, but it easily could be the center of the western basketball world this weekend, Division III style. Update (10:30 a.m.): Our prognostication was off in one small way. Whitman is hosting, Whitworth is also in the pod and playing Claremont-Mudd-Scripps. The one miss? The fourth team is from Texas. Our bad. The tournament bracket will be here. • In case you are wondering, the tournament bracket will be announced at 9:30 a.m. You can watch it here. WSU: Nothing much coming out of Pullman – except the women will get back on the basketball court on Thursday at the conference tournament in Seattle – today but we do have some news from around the Pac-12. … There was one men’s game yesterday and it was in Boulder. Colorado kept its NIT “dreams” alive but dealt a big blow to UCLA and its hopes of making the NCAA tournament as an at-large entrant. … Utah has more modest goals right now. … How can anyone be certain about this? Or this? If Sean Miller is ever fired, there will be a lawsuit, that’s for sure. … Finally, meet the pitcher who threw Washington’s first-ever perfect game. Gonzaga: The West Coast Conference tournament schedules are set, with Gonzaga’s women beginning Friday and the men on Saturday. Whitney Ogden has all the information on the women and Jim Meehan the men. … When Jesse Wade entered the first half of the BYU game Saturday, it was an unexpected occurrence for most GU observers. But Wade’s friends and family in attendance greeted it warmly. Jim has more in this story. … There is a story on Wade from Utah as well. … The Gonzaga baseball team picked up one win in a three-game series at the coolest baseball facility in America. … Around the WCC, there was huge news last night and it wasn’t even from the basketball court. USD coach Lamont Smith was arrested as the Toreros were leaving the Bay Area on domestic violence charges. The charges stem from an incident in his hotel room. … The conference tournament gives BYU a chance to remake its season. Chiefs: Talk about being on a roll. Spokane won three times over the weekend, the final one yesterday at division-leading Everett. Not even travel problems could derail the Chiefs. Mariners: The Seager family is turning into baseball royalty these days. … Former Gonzaga pitcher Marco Gonzales hopes to be one of those feel-good stories the M’s need so badly this season. … Daniel Vogelbach has a bum wheel. Ryon Healy is headed back. Seahawks: The Hawks will have so many new faces on the coaching staff they may need to wear name tags. Sounders: It’s true. Jordan Morris did tear his ACL on the worn artificial turf in El Salvador. … Portland has some questions as well heading into the season. Published: Feb. 26, 2018, 8:34 a.m.
Get the day’s top sports headlines and breaking news delivered to your inbox by subscribing here.